Hard to believe it's the end of 2009. Winter started out with snow but it fizzled out and more or less stopped. Just small 3 to 6 inches of snow at time and much of it melts before more falls. None of the ski areas are fully open. Many have only a quarter of the runs open. So far, it has snowed five or six inches for Christmas. We made it to the ranch both at Thanksgiving and on the 19th of December. There is not a lot of snow, as you can see in the photos. It was, however, quite windy and cold both times. Thanksgiving was not as windy and we stayed for a few hours. On the 19th, it was very cold. We got out for maybe 10 minutes, let my puppy run around and then left for Casper. 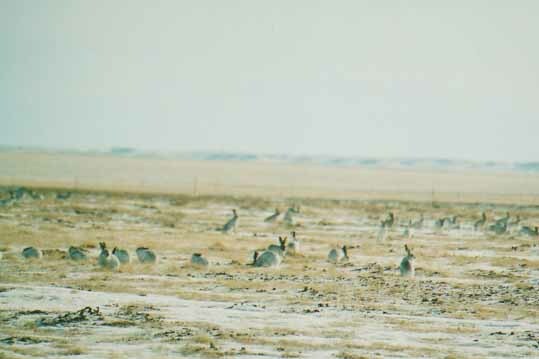 The jackrabbits have started gathering at Dr. Dorothy's lot. I put in a picture of the group! As winter continues, more will come and hopefully she can provide additional photos! It's really quite remarkable how they gather on her lot each year. I still have a bit of summer left. I found a pansy still growing in the greenhouse in October and brought it in the house. It finally bloomed about two weeks ago. 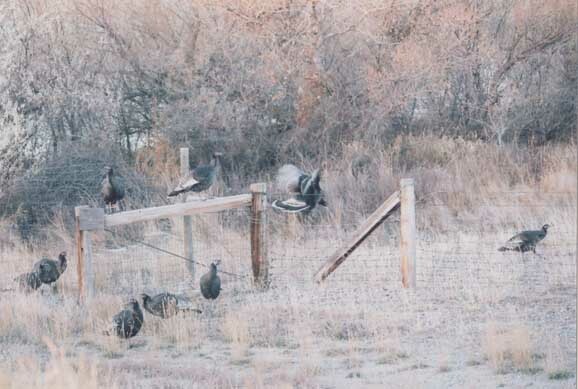 I am including pictures of some wild turkeys we saw Thanksgiving morning. The turkeys would hop up on the brace panel, walk across the panel, then hop off on the other side of the fence. It was very fascinating to watch. I have no idea why they hopped up on the panel, then jumped off to the other side. Maybe they can't fly over the fence very easily and the panel made it easier. It was too dark to get a really good video of the process. Maybe I can lighten the video I did take and post it later. Wildlife has not been gathering in the usual numbers. If I go with free food handouts (aka bird feeder filled with seeds) the sparrows show up and empty the feeder in a day. Once the feeder is empty, they will eat any bread, suet, etc that I put out for them. I guess they have not yet been weaned over to "people food". Extreme cold shows up in all kinds of places. These are the nails on my bathroom window when the temperature fell below zero by 20 degrees or so. Both of our storm doors were covered in frost for several days also. My small dog got very cold feet a couple of times and would hardly come back up the ramp to the house without a lot of coaxing. In previous years, she has gotten cold enough that we had to go get her and bring her in. This only takes 2 or 3 minutes in extreme cold. Small dogs don't deal well with the weather! These guys showed up a couple of days ago. There are only half a dozen, but the bucks are quite large. The deer don't stay in my yard very long, as they did in the past. My yard is more of a pass-through buffet than a hotel!